Calling all Wannabe fitness fanatics! If you are a PS3 owner with no time for the gym but the will to keep fit then I think I might have found the perfect game for you – Get Fit With Mel B featuring everyone’s favourite ‘Scary’ Spice Girl! 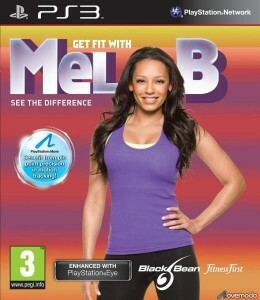 Get Fit With Mel B is one of the first fitness games to be released for the PS3 that incorporates the new Playstation Move accessory. Ahead of playing the game my expectations were fairly low as I have good experiences using the tried and tested Wii Fit board and was unsure of the sometimes brash Mel B’s pulling power in terms of the license itself. In fact this was to be the first time since Britney’s Dance Party on the PS2 that I have played a celebrity endorsed game. However despite my initial reservations I was pleasantly surprised with the user friendly setup, the flow of the game and my overall experience in general and Miss B certainly comes across as knowing what she is talking about when it comes to fitness and healthy eating. On first booting up the game you are required to set up a personal profile. This involves answering a selection of basic questions regarding, amongst other things, gender, height, weight and age. You will also be asked you whether you have any fitness equipment to hand – for example: ankle weights or an exercise ball. Don’t worry if you don’t have any of the relevant exercise equipment as Mel B will still try to whip you into shape (or keep you there) but to get the most from the game it might well be worth investing in at least one other piece of suggest fitness equipment for future workouts. Once you have completed the initial set up the Playstation Eye camera will scan your image. This helps the game figure out the amount of calories you are burning and really helps build a more in-depth profile of you over time. 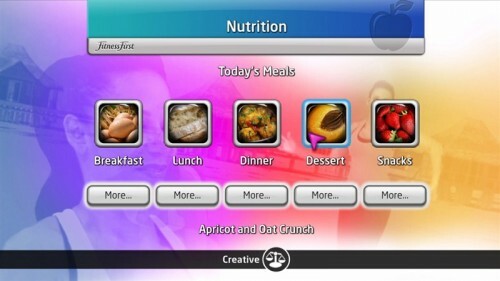 You will then be asked a second series of question based of food preferences such as “likes” and “dislikes”, this in turn presents you with a meal plan based around the things you like to eat whilst keeping the menu on the right side of balanced and healthy. 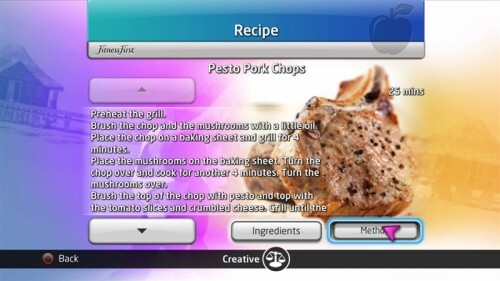 Once you have set up your meal plan the game will begin to recommend something healthy to eat for as soon as your next meal – it will also tell you what ingredients you will need and how long it should take to prepare! This was a much appreciated feature that added considerable depth and increased my confidence in the quality of the product – it was a pleasant surprise and really not something I was expecting to find within what I initially thought might be a fairly heavy handed and simple workout game. Next up you move on to selecting your goals. These range from “de-stress” (losing your jelly Belly) to “tennis fit” (keeping up with the kids – my option of choice). Finally, you are prompted to select the length of your workout and when you are ready to begin your first session simply select it from the menu. Mel B will then run through each of the exercises within the game in a handy video tutorial that also allows you to replay what she’s doing to ensure you fully understand. If you find your first workout a little bit too intense or even not intense enough don’t worry as this can be changed at any time from the settings in the easily accessible main menu. The daily workouts within the game are quite varied to prevent boredom and seem really well tailored to your body type and personal preferences – from a high intensity session that will get you sweating and will possibly make you feel sore in the morning to a much slower pace that is a great starting point if you are new to keep fit, perhaps older (or younger) or if you just want to burn off that sneaky chocolate bar you just had! During the routines you actually appear on screen next to Mel B – almost like a surrogate Spice Girl! There is a body outline guide on-screen so you can always adjust yourself/or your camera to ensure you are in the ‘sweet spot’ and your motion is properly tracked. Once correctly calibrated you’ll be asked if you have any weight training equipment you would like to use but once again additional equipment is not required and is an added bonus and an example of the quality of content and thought put into the game which really does strive to reach everyone. And remember you can always incorporate them into your routine at a later date without missing a step. Mel B then walks you through a practice rep of the upcoming exercise that have been selected for you, setting the amount of reps you are to do and counting them down as you go. The workouts I experienced lasted for around 30 minutes and involved lots of different moves and variety with some exercises requiring only a few reps and others going over 40. In fact the amount and variety of aerobic techniques on-hand is very impressive with apparently well over 200 unique exercises within the game. With this in mind it would be an idea to keep a drink such as water to close hand to keep you properly hydrated throughout your routine. After each workout there is a section whereupon you can chart your progress and how close you are to achieving the goals that you have set within the game. This provides a motivational boost as you can physically see your progress over time. In addition there are performance graphs which map how well you performed during the routine, giving you a good idea of where you might have slowed down and have room for improvement and where you are excelling. You are also given a calorie count total which is based on a percentage of successful reps in each given routine. Finally there is your “fitness star rating” which like Nintendo’s Brain Training, can fluctuate from one session to the next depending on whether you have got those jumping jacks moves down to a tee or not! Finally, if your scheduled workouts are still not enough or have you energized for more there are some great additional exercises and features within the game from relaxing yoga to more vigorous dancing. With it’s slick interface and clean, colourful appearance Get Fit With Mel B is an assuredly professional looking package and one which a lot of care and attention has obviously been poured into. The in-workout dual display of both yourself and Mel B looks great and is certainly very motivating. You also have a number of different backgrounds to choose from that include such locations as an apartment space, infinity pool or even Central Park. In a nice touch there are also additional locations that can be downloaded via the Playstation Network. The music is very well suited to the style of game but if you find it gets a little annoying or repetitive you have the option of listening to your own music or switching it off altogether if you prefer. Overall I have enjoyed Getting Fit With Mel B despite my thinking it would be nothing more than a Christmas cash in. It isn’t in fact it’s well thought out and quality piece of software that really punches above what some might think is a questionable licence. The only negative factor I found with this game was that the still in it’s infancy Move controller can sometimes misinterpret certain movements – a real pain after you have sweated out a routine for 20 mins only for the game to temporarily lose ‘sight’ of what you are doing resulting in a lower than expected score. Somewhat discouraging if you thought you were doing so well on that particular workout but potentially fixable via a patch should it be a widespread problem and not just an issue with the calibration. A notable plus point is the addition of in-game trophies for all those trophy hunters out there but be warned – if you want to achieve them all you will be gunning for one massive workout as some are not that easy to achieve. Best let the hospital know in advance! Go on, Spice Up Your Life!